By Chris Williams on July 7, 2011. Q. We have some yellowjackets on our front porch that seem to be using a paper wasp nest. They keep buzzing us every time we walk by. I thought yellowjackets nested in the ground. A. Yellowjackets do nest either in the ground or they make enclosed papery nests in trees or shrubs; they do not occupy paper wasp nests. I think you may have made the acquaintance of the European paper wasp which looks very much like a yellowjacket! Most people are familiar with paper wasps (also called umbrella wasps) and their upside-down umbrella shaped nests. Nests are attached in shaded, protected sites on a building such as under eaves, on porches, behind shutters, in vents, in attics, under decks, or around window frames. We have a relatively new, more aggressive paper wasp in our area that, in addition to the usual paper wasp sites, is more likely to nest in hidden areas like cracks, crevices, and voids in buildings. The European paper wasp also nests in barbecue grills, outside lighting fixtures, bird houses, vehicles, sheds, and just about anyplace else. The European paper wasp, Polistes dominula, was first discovered in Cambridge, Massachusetts in the early 1980’s. It is considered an invasive species and has displaced native paper wasps in many areas it has populated. These wasps outcompete native wasps because they establish their colonies earlier in the spring and are able to collect prey sooner. They also can establish a colony more quickly than native paper wasps because they will sometimes re-use their old nests. This is all a bad thing because the European paper wasp is much more of a problem than native paper wasps in many ways. 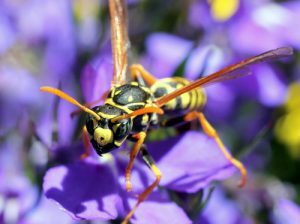 It is more aggressive than the native paper wasps and its habits are more like that of a yellowjacket. As you know, to the untrained eye, it even looks like a yellowjacket. It’s black and yellow like a yellowjacket but it has the much thinner “waist” of a paper wasp and during flight its legs dangle down below the body like a paper wasp. The European paper wasp is a problem because it nests in hidden sites. It aggressively patrols the nest area and can detect movement at 12 to 20 feet from the nest. It typically will not attack and sting intruders unless they are just inches away. But because the nests are often hidden, the chance of an unpleasant encounter is increased. Controlling the European paper wasp includes (1) controlling new nests as early as possible while they are still small, and (2) preventing nest building. Store-bought wasp sprays may kill the adult wasps but have little impact on the larvae and pupae inside the nest. When nests can be reached, they should be removed and destroyed to kill the brood and prevent the wasps from re-using the nest. Give the pros at Colonial a call. We can take care of European paper wasp nests and can also caulk and seal the openings around your home that wasps use for nest building. This involves repairing and sealing holes in walls, soffits, eaves, and screening vents and louvers. This type of pest-proofing is a good investment because it not only eliminates nest sites for wasps, but prevents entry of many other pests as well. We can help protect your family and your home.